There are two kinds of cases that are heard in the trial courts, the Indiana Judicial Branch website explains: civil and criminal. Civil cases involve conflicts between people or institutions. They might involve divorce, child custody, or business contracts. 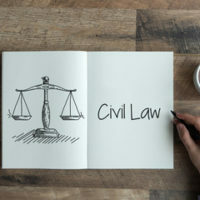 Civil cases might also be personal injury cases, where a person has been injured and seeks money damages from the person or institution at fault. After an auto accident, for instance, one driver might be suing another. Neighbors might be involved in a dispute over who should pay to repair a common sidewalk or fence. The main difference between civil and criminal cases, the Judicial Branch explains, is that in a criminal case, the party pressing charges is seeking punishment; in a civil case, the party pressing charges is seeking money. In the case of plaintiffs Kevin Brown and Beverly Dianne Brown, which Ramey and Hailey Law is representing vs. the Indianapolis Metropolitan Police Department, the City of Indianapolis, and Officer Emily Perkins, that personal injury lawsuit is about much more than money or even punishment – it’s about civil rights. “The City of Indianapolis’ practices, customs, and policies, as well as its failure to train and supervise, resulted in a deprivation of the Plaintiffs’ rights under the 4th and 14th amendment of the Constitution of the United States,” the Complaint alleges. Amendment IV states that it is the right of the people to be secure in their persons, houses, papers, and effects, against unreasonable searches and seizures, while Amendment XIV states that all people deserve equal protection of the laws. “Officials and officers of the IMPD were well aware that there was disproportionate tendency for police officers to detain black citizens without justification,” the civil suit document explains. Brown vs. IMPD is about much more than punishment or money – it’s about principles!